Anti-Spam enables you to manage email which is probably spam by placing it in quarantine where you can review, release or delete it. Note: You must have administrator or SMTP quarantine permissions to access the SMTP quarantine pages. Permissions are set on the System > Administration > Administrative users page. Any users subscribed to Anti-Spam’s spam quarantine service will receive a summary email listing email messages addressed to them which have been placed in quarantine. The summary email contains links to the quarantined message(s). Users can use the links to preview and release the messages. Users can also use a link in the summary email to request an updated report. This lists all the spam from the last 24 hours. Each email message received by Anti-Spam is given a spam score which indicates the probability that the message is spam. The higher the score, the higher the probability. You can use this score to determine whether to quarantine or drop the message. 1. Go to the Email > Quarantine > Settings page. • Enable quarantine — Select this option to quarantine email messages which have a higher spam score than specified in the Quarantine above spam score parameter. 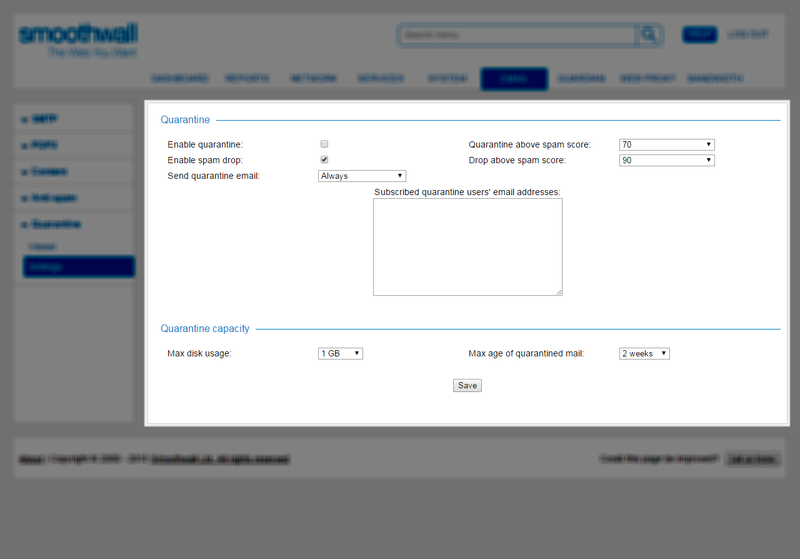 • Quarantine above spam score — From the drop-down list, select the spam score above which messages will be quarantined. • Enable spam drop — Select this option to drop email messages which have a higher spam score than specified in the Drop above spam score parameter. 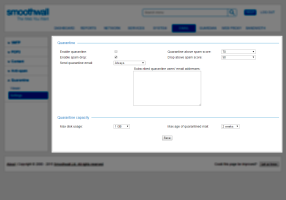 • Drop above spam score — From the drop-down list select the spam score above which messages will be dropped. Select to always send a daily summary of the user’s quarantined email. Select to send a daily summary of the user’s quarantined email if email has been quarantined. Select to never send a daily summary of the user’s quarantined email. • Subscribed quarantine users' email addresses — Enter the email addresses of the users you want to subscribe to the quarantine service. Enter one email address per line. • Max disk usage — From the drop-down list, select the maximum amount of disk space to be used to hold quarantined email. If the size limit is reached, Anti-Spam deletes messages newer than the configured maximum age. • Max age of quarantined mail — From the drop-down list, select how long to keep quarantined email before dropping it. Anti-Spam prunes quarantined email every hour and deletes messages which are older than the age specified. 3. Click Save to save the settings and enable quarantine.